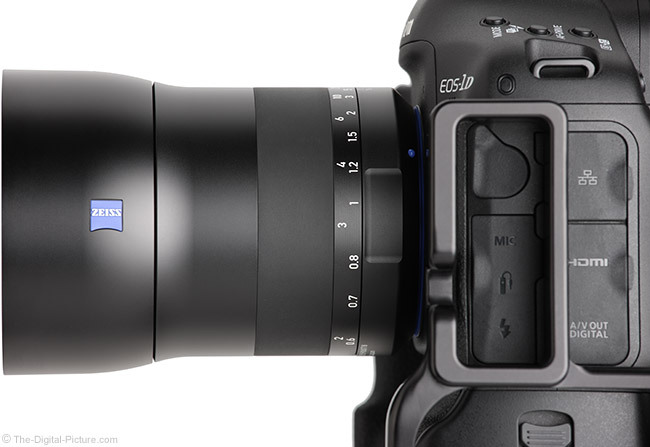 Image quality results have been added to the Zeiss Milvus 100mm f/2M Lens page. Image sharpness, while extremely good, is not alone going to drive many upgrades from the Zeiss 100mm f/2 Macro Lens because ... it was already great. However, image sharpness is not going to impede anyone considering the purchase of this new Milvus lens as it is also a great one. B&H has the Zeiss Milvus 100mm f/2M Lens in stock. As trees are usually much taller than us, it is common is for us to look upward at leaves or minimally view them from a side perspective. Also typical is for the leaves to be facing, at least to some degree, upward and for the light to be reaching the leaves most strongly from above. While photographing glowing backlit leaves from underneath is commonly recommended (and a good tactic), the top of leaves generally have the strongest color with that color facing the light. Thus, capturing the best leaf color in the best light often means photographing the top of leaves. Because most leaves (on trees at least) are higher than us, moving in close to the tree can diminish the amount of color seen. Moving farther away, unless that distance means a lower elevation, can provide a more colorful view of a tree by simply lowering the angle of view. Better is to get a higher vantage point. This means going up on a hill, up on a deck, up in a building (shooting from an open window for example), up on a ladder, etc. A photo accessory that I've long considered acquiring, one that would help greatly in this regard, is a Bucket Truck. I know, you think I'm kidding, right? Not so. I think having such a truck would be a competitive advantage and I am always seeing locations where I could make use of one. I don't know if that idea will ever come to fruition for me, but more popular is the use of drones. While the rules and regulations book for use of these devices is still being written, drones can get to many locations that would previously have required a bucket truck, crane or helicopter. Getting above the leaves is no problem for a drone. If moving up means moving back, a longer focal length lens may be desired to keep the same framing and that the perspective will change should not be overlooked. 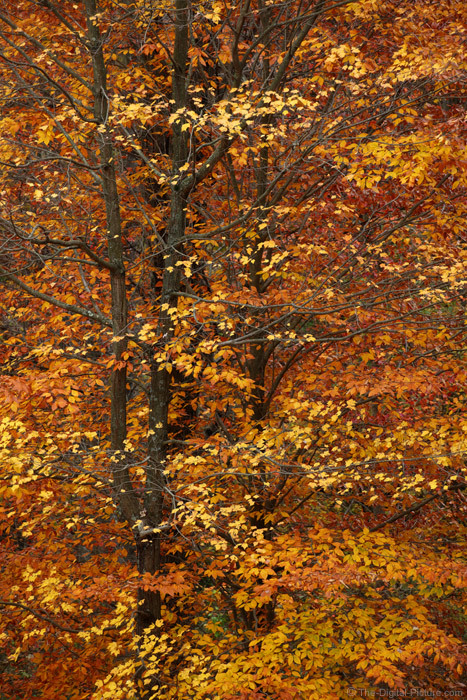 I was evaluating the Tamron 35mm f/1.8 Di VC USD Lens and while looking down the steep hill from our house, a beech tree with various shades of yellow and salmon-colored leaves caught my eye. At 35mm, the tree was tiny in the frame, so I went down to it. The closer I got, the less I was noticing the color patterns that initially caught my attention and the more I was looking across the side of the leaves, leaving the bare woods showing through the color. While still beautiful, this was not the image I had envisioned from the top of the hill. I took some photos that I liked at 35mm, but then went back to the house to mount the Canon EF 100-400mm f/4.5-5.6L IS II USM Lens. With the narrower angle of view, I could easily fill the frame with color and the downward view on the leaves left few holes into the background. 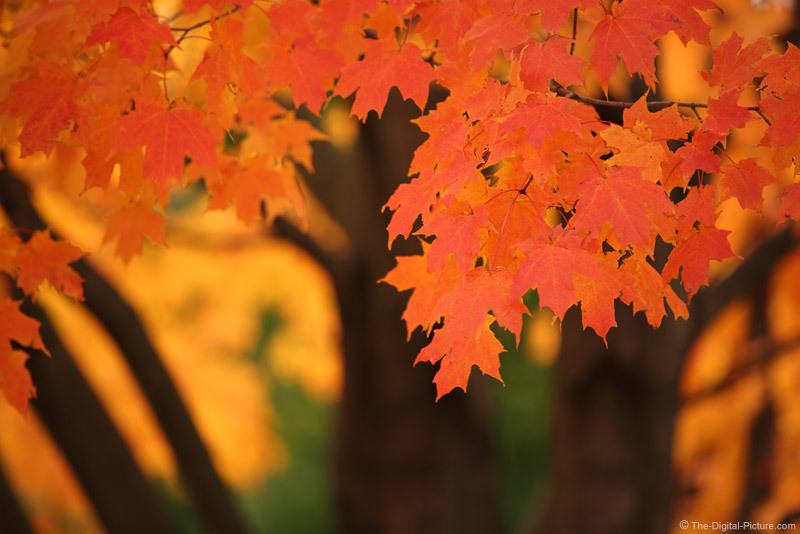 The next time you are looking at beautiful fall foliage, consider moving to a position that affords a downward view to maximize the color available to you. GRAND RAPIDS, Mich., October 22, 2015 - X-Rite Incorporated, a global leader in color science and technology, and its subsidiary Pantone LLC, today announced that it is launching two new products in its popular ColorChecker series. ColorChecker Video and ColorChecker Passport Video targets reduce video editing time, improve color balance control, make it easier to match multiple cameras and simplify editing for mixed lighting conditions. The ColorChecker brand from X-Rite has enjoyed a positive reputation in the photo market for nearly 40 years. Now, the ColorChecker targets for video bring that unique color science to the world of video, delivering versatility on set and improved productivity in editing. Professionals and hobbyists using Adobe Premiere, Apple Final Cut Pro, DaVinci Resolve, Avid and other video editing software will be able to take advantage of ColorChecker targets specifically tuned for video production. The new X-Rite ColorChecker Video targets are available in two forms to deliverconsistent, predictable and repeatable results, frame to frame and camera tocamera. A color reference for evaluating specific chromatic colors aligned with video production, including skin tones, gray balance and highlights and shadows. White balance for creating a consistent neutral white point, eliminating the need to correct each frame later. 3-step grayscale target that includes white highlight, 40 IRE midtone gray and saturated black references. A focus target that facilitates center and edge focus. A range of skin tone patches from light to dark along the outer edge for easy alignment. A series of saturated and desaturated chromatic colors allowing for appropriate color and saturation adjustments. A full size white balance target on the reverse side. B&H has the X-Rite ColorChecker Video products available for preorder. Here's a quick, cheap way to create a ghost effect, in-camera, without any VFX! Also known as "Pepper's Ghost", this effect has been around for ages, and is still used today. Disneyland's "Haunted Mansion" and the Hogwarts Express at Universal Studios both use this effect, and a modified version is still used in modern tele-prompters. Canon Wonders, "Just How Obsessed are Photographers?" Professional photographers are obsessed over the details, but we wanted to find out how obsessed. We invited three people to analyze the same print and used eye-tracking technology to trace every eye movement they made. In the end, it was clear, a photographer's obsession is unmatched. Luckily, there's a printer that's equally obsessed - the Canon imagePROGRAF PRO-1000. B&H has the Canon imagePROGRAF PRO-1000 Professional Inkjet Printer available for preorder. Permalink: Canon Wonders, "Just How Obsessed are Photographers?" B&H has almost all of the newly released Wacom Intuos Pen Tablets in stock with free expedited shipping. The one notable exception is the Wacom Intuos Draw Pen Small Tablet (Mint Blue) which is not yet in stock but is available for preorder. B&H carries the Nikon D810 DSLR Camera. You want to purchase something from B&H, but its value doesn't put it over the free Expedited Shipping threshold? While the item may qualify for free standard shipping, getting my newly purchased gear sooner rather than later is my personal preference (I might be a tad impatient). With that in mind we've developed a list of relatively inexpensive items that may be less practical when purchased on their own, but instead can help push you over the Expedited Shipping threshold when bundling with other purchases. This stuff is a no-brainer. Gaffer tape is a photographer's best friend. It's strong, peels away without making a mess and is even reusable (to some degree). It comes in a variety of widths, lengths and colors and having a roll on hand can literally save a shoot. If we listed all the ways we've used gaffer tape over the years, this post would turn into a Potter-like epic. If you don't have any gaffer tape, add some to your cart. If you already have gaffer tape, adding another roll to your inventory is still probably a good idea. If it's been a while since you've purchased a new Canon lens, then you're missing out on Canon's new, very convenient center pinch lens caps. The new lens caps are a worthwhile investment especially if you typically have a lens hood mounted to your glass. 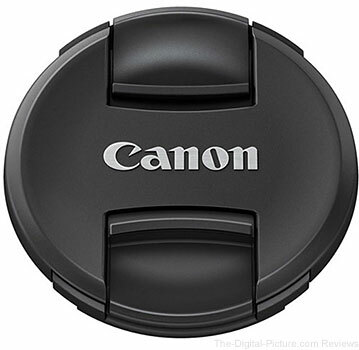 Don't want to shell out for the Canon-branded lens caps? 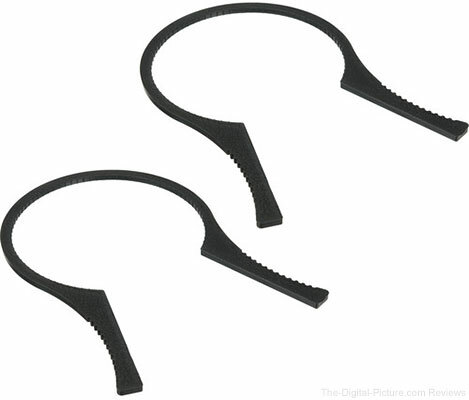 Third-party center pinch lens caps are also available at a significantly lower cost. And while we're on the subject of "caps," it's not a bad idea to keep extra body or rear lens caps on hand in case you lose one (I can't tell you how many times I've misplaced a body cap). A lens hood is an excellent accessory to add to your kit if your lens(es) did not come with one. Not only can they prevent lens flare in your images, they can also help protect your lens's front element from impact. Typically speaking, Original Equipment Manufacturer (OEM) lens hoods are pricey. 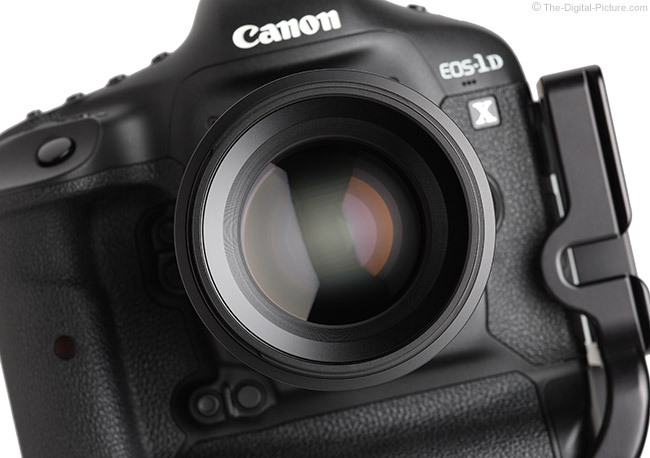 However, as lens hoods are typically easy to design and relatively inexpensive to manufacture, purchasing a third-party lens hood makes a lot of sense. Third-party lens hoods may not fit quite as well as the OEM ones and they may lack special features (such as interior flocking), but otherwise [typically] work just as well as their more expensive counterparts. How much can you save by purchasing a third-part lens hood? 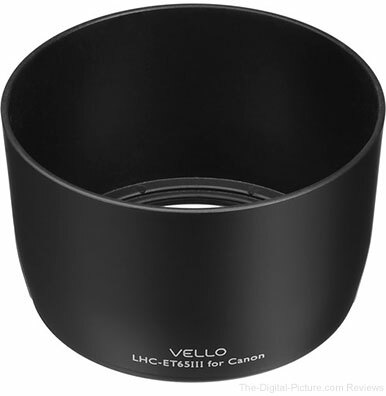 The amount varies widely, but here's a good example: the Canon EF 100mm f/2.8 Macro USM uses the ET-67 Lens Hood which will set you back $36.00 for the OEM version; the third-party Vello hood is only $14.95. There are few things I loathe more than a scratched LCD screen; that's why nearly all my electronic devices (including cameras) have a high quality screen protector in place. I specify "high quality" because there are a lot of low quality (less durable, less clear) screen protectors out there. I've personally used dozens of screen protectors over the years with various levels of satisfaction. 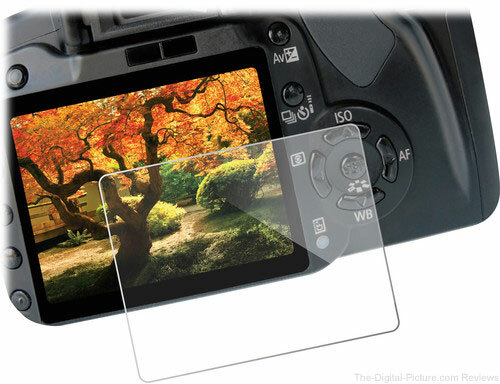 My current personal favorites for camera LCD screen protectors are the Vello LCD Screen Protector Ultra series and the slightly cheaper Vello Glass LCD Screen Protectors. The former is a perfectly-sized piece of transparent optical glass while the latter has a small black frame around the edge that shows branding and the protector model number (but the frame isn't distracting in my opinion). If you've ever experienced stuck filters (especially if one of them is a circular polarizer), then you'll likely already know the true value of these inexpensive tools. Filter wrenches take up very little room in your gear bag and can save you the huge headache of dealing with filters that are stuck together while you're on a shoot. If these angst avoiding tools are not already a part of your kit, you'd be wise to bundle them with your next purchase. 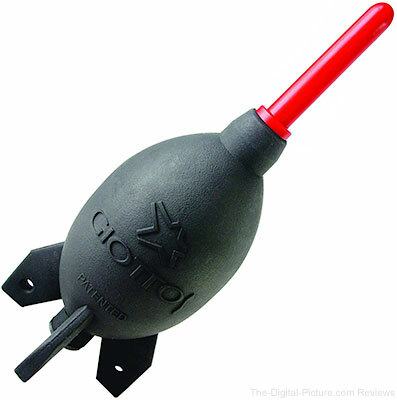 This is another one of those must-have tools that ranks up there with gaffer tape and a microfiber cloth – the Rocket Blower. Regular use of a Rocket Blower can help keep your sensor clean of dust and debris that may impact image quality with the result of time consuming post-processing needed to remove the distracting artifacts. Need to create high quality product images? The Rocket Blower can help you remove dust from the items so that your images look more professional. Indeed, using a Rocket Blower is Bryan's first step when creating the product images used for this site. If a Rocket Blower is missing from your kit, bundling one with your next purchase may be a smart way to surpass the Expedited Shipping threshold. Keeping a desiccant (or two) with your camera gear can help prevent the growth of mold and fungus which can [understandably] degrade image quality and significantly reduce the resale value of your equipment. 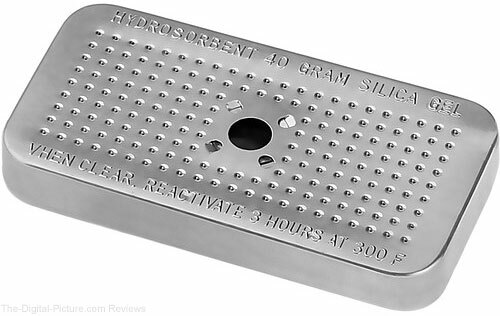 The most well-known and widely available type of consumer desiccant is Silica Gel which usually comes in single-use packs or reusable canisters that are reactivated by heat (usually an oven). My suggestion - buy both. Keep the reusable desiccant with your gear stored at home and throw a couple of single-use packs in your gear bags (and replace periodically) for the ultimate in moisture protection. If you're unfamiliar with what a gray card can do for you, Bryan's Gray Card review written several years ago is just as relevant today as it was then. The short version: a gray card can help you set a custom white balance in-camera (reducing post-processing) as well as assist in determining exposure values based on a meter reading off the card. I'm finding a gray card to be indispensable when shooting Super Color IRs as getting the correct white balance in-camera makes post-processing so much easier. One really nice thing about the 8x10" gray card is that it can easily be stored in your camera bag's laptop compartment (if the bag has one) which helps protect the gray card while also allowing it to be nearby whenever you need it. 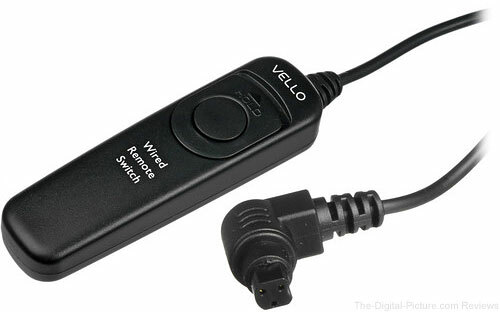 A Remote Switch is a simple tool that allows you to trigger your camera's shutter without touching the shutter button. It's not as handy as an intervalometer (an intervalometer can do everything a switch can do and much more), but if you don't need the intervalometer's additional functionality, the remote switch is a good item to have at your disposal. The remote switch can prove especially beneficial if photographing young children by allowing you to make eye contact with the subject(s) while triggering the camera from a short distance away from the camera. The remote switch can also be helpful in bulb mode because the shutter can be locked for an indefinite period of time and released without ever having to touch the camera. Full Disclosure: I do not actually own this product... yet. 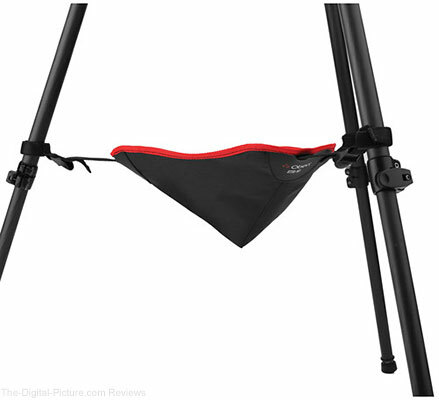 I ran across the Oben Tripod Hammock a few days ago and I thought it was a really interesting, novel piece of gear. The hammock is suspended by the legs of your tripod and can be used hold filters, lenses, microfiber clothes, or anything else you might need while shooting from a fixed location. Even if your tripod features a hook on the center column, you may even prefer to use the hammock for your ballast needs as it will be less susceptible to wind. So that's 10 general purpose add-ons you can use to help qualify for free expedited shipping. What do you think? Any additional suggestions? 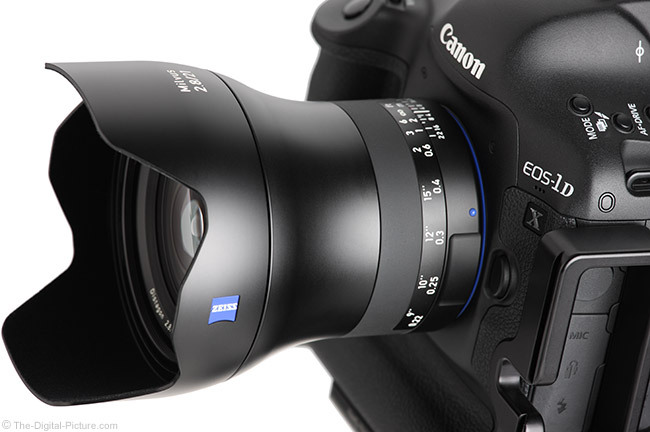 Image quality results have been added to the Zeiss Milvus 50mm f/1.4 Lens page. While I gave the "Most Beautiful Lens" title to the Zeiss Milvus 21mm f/2.8 Lens, the Zeiss Milvus 50mm f/1.4 Lens is not far behind it on my list. This lens feels at least as nice in hand as it looks in the pictures. Many more relevant comparisons exist. Build your own. B&H has the Zeiss Milvus 50mm f/1.4 Lens in stock. If you're a lighting enthusiast like me, this is the kind of video you love to see. Karl Taylor & Urs Recher demonstrate how to use soft & [very well-controlled] hard light to highlight engraving detail on glass. One technique that I found especially interesting in this video was the simple use of a white card to help illustrate the projection of the back light's modeling lamp. The functionality of a product must be the highest priority, but I'll argue that us photographers, by trade, appreciate design and beauty in a product more than the general public. Since it is photographers that look at and handle lenses most, it is only fitting that a lens has a beautiful styling. I am pleased that lens makers are taking style into full account with their latest releases, including Sigma's Global Vision lines, Tamron with their latest primes and now Zeiss with their new Milvus lenses. A few of the new Zeiss Milvus lenses just arrived and product images are usually first on the evaluation to-do list. Avoiding as much of the inevitable-with-use dust and finger prints saves lots of post processing time. I had seen the Zeiss product images distributed along with the Milvus press release, but the new Zeiss Milvus 21mm f/2.8 Lens really caught my attention immediately out of the box. It was love at first sight. The smooth, modern, curved metal design is drop-dead gorgeous. Lenses are meant to be used for image making and ... this lens makes for a great image. Thus, I'm going to declare the Zeiss Milvus 21mm f/2.8 lens to be the new "World's Most Beautiful Lens" titleholder. That is my opinion of course. Which lens is at the top of your most beautiful lens list? People seem to enjoy being creeped out around this time of the year (Halloween) and spiders are a perennial favorite source of creepiness. 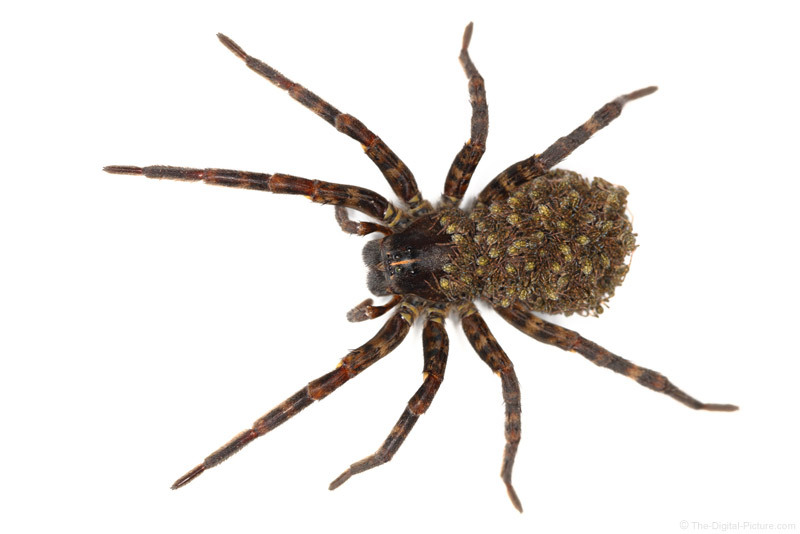 They happen to be my wife's biggest fear at any time of the year, so when I brought a mother wolf spider carrying a big "cluster" of babies into the house for a photo op (it was dark outside), she was not too happy. And when the spider jumped off of my white paper background and lost her cluster, I went back outside (after corralling what seemed like hundreds of tiny baby spiders). I wasn't looking to create an award-winning photo of this spider, but wanted decent quality without much time investment. I mounted a Canon EF 100mm f/2.8L IS USM Macro Lens to a Canon EOS 5Ds R and attached a Canon Macro Ring Lite MR-14EX II Flash. The scene was dark (even inside) and the lens shaded the subject at this distance, so I utilized the MR-14EX's focus assist lights to manually focus on the mother's eyes (all 8 of them) with the plane of sharp focus angled to include many of the babies. As mentioned, I went high-tech with the background: a sheet of white printer paper goes with everything. With the main subject being medium-dark colored, I was able to boost the highlights slightly in post, creating a pure white background, without negatively impacting the mid and dark tones. Spiders are a popular fall theme and that is probably the only time of the year when you can post a spider picture that gets socially shared. Find out who has arachnophobia. Dig out one of your spider pics or better yet, go create a new one. Share it and peg the creep-out meter. Canon has released its 3Q 2015 financial results. As usual, the Presentation Material is our preferred method for getting the highlights. Do you ever feel stuck in a rut, creatively speaking? You've got all this great gear at your disposal but you're simply not inspired by your surroundings? That's an unfortunate side effect of the human condition – we start losing appreciation for the things (and people?) we see on a daily basis. Even the extraordinary can seem mundane if we see it every day. Aside from taking a vacation and enjoying the benefits of exploring a new place (providing an excellent source of inspiration), there are several things you can do right in your own hometown to help quell the "been there, seen that" blues. And many of them require little to no investment in new gear. A common (and useful) technique is to limit yourself to shooting with a single focal length. But as that approach has been covered by just about everyone, let's look at other ways to inspire your own creativity. One particularly intriguing camera feature that has trickled down from high-end bodies in the past few years is the Multiple Exposures feature (found in the EOS 1D X, 5Ds/5Ds R, 5D III, 6D, & 7D II). 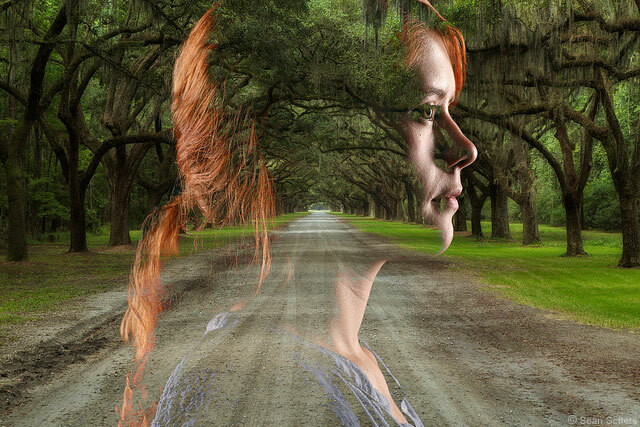 A multiple exposure is just what it sounds - a single exposure created by combining two (or more) individual shots. The possibilities for creative multiple exposures are limited only by your imagination, and forcing yourself to think about your multiple exposure before capture is an excellent exercise in creative thinking. Using Live View in Multiple Exposure mode enables you to preview the result you can expect after capture. If you don't have a camera that features Multiple Exposures, you can easily recreate the most common multiple exposure effect in Photoshop by layering one image over another and setting the top layer's blend mode to "Lighten" (that's exactly what I did for the image above). As photographers, we're used to capturing the world in split seconds. Movement is frozen in when our shutter speeds are short enough and our images are sharpest. Capturing an image that spans seconds (if not minutes) can completely change the dynamic the scene. 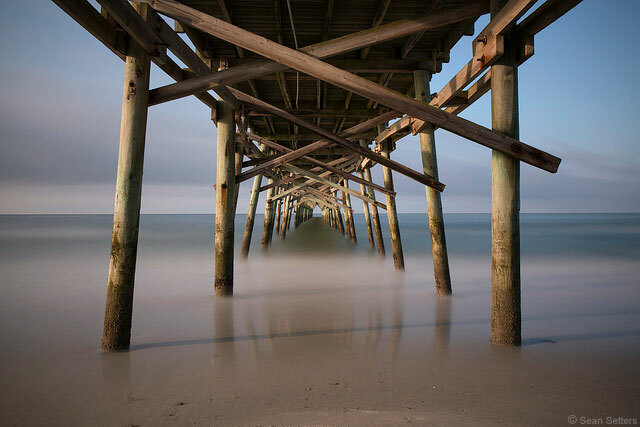 A tripod and 10 stop neutral density (or even more dense) filter can allow water along the beach to appear as flat as a sheet of glass or can aid in reducing the evidence of people when photographing in a crowded place (think architectural photography). A neutral density filter isn't necessarily required for creating long exposures. If shooting at night, you can easily use just a tripod (or other means of support) to help capture light trails left by passing vehicles. Shooting in infrared is a great way to help you break out of a creative slump because it allows you to experience the world in a whole new way. Suddenly, drab and familiar landscapes become intriguing when capturing the typically unseen wavelengths. There are a couple of ways to capture infrared shots. The first and least expensive way is to purchase a filter that blocks visible light but allows IR light to pass through. When using the infrared [passing] filter, your exposure times will be very long (sometimes minutes). That's because your camera has a built-in infrared blocking filter that prohibits most of the infrared light from hitting the sensor. The infrared filter on the front of your lens allows you to create an exposure out of the trickle of IR that makes it through to the camera's filter. For these shots, a tripod (or other stable shooting platform) is essential. Keep in mind that with the IR filter in place, you cannot see through the viewfinder (and you'll see very little if anything in Live View). Therefore, you must frame and focus your shot before placing the IR filter on the camera. And since IR light focuses at a slightly different point than visible light, you'll want to shoot at or near hyperfocal distances with a narrow enough aperture to compensate for focus shifting. Another piece of gear helpful for capturing images with an infrared filter is the timer remote. The timer remote/intervalometer will allow you to shoot exposures longer than 30 seconds without having to continually hold down the shutter button (as in Bulb mode). Some newer camera bodies – like the 7D Mark II and 5Ds/5Ds R – feature an in-camera bulb timer and will not require the remote timer accessory. 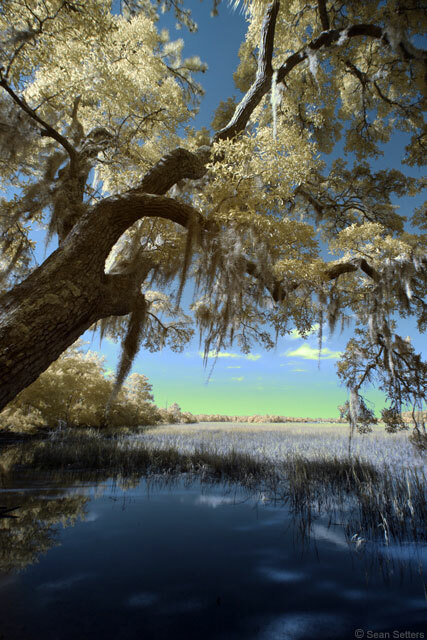 If you'd like to dive into infrared photography head first, you can have your DSLR converted to an infrared camera. The cost will vary depending on your camera body and filter option, but the conversion will likely be in the ballpark of $300.00 (or more, depending on camera model and options). One big benefit of an IR conversion is that your exposure times will closely mimic your exposure times for visible light, meaning a tripod isn't absolutely necessary. However, you will need to compose and focus using Live View because visible light no longer passes through to the viewfinder. If you only have one camera, I wouldn't suggest an IR conversion. Converting your camera to infrared means that you can no longer capture visible light with your camera. However, converting an older DSLR to infrared after upgrading cameras is a great way to extend the useful life of your likely-to-be-neglected equipment (assuming you don't need a backup camera). That was the motivating factor for sending my rarely-used EOS 7D to Life Pixel for an infrared conversion. 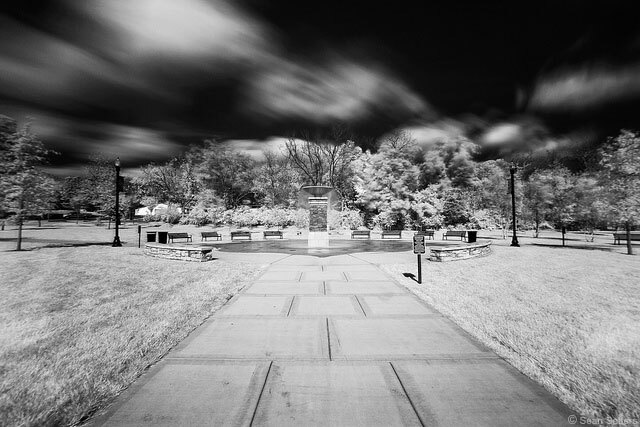 With my newly converted 7D in-hand, infrared photography has never been more fun and inspiring. The image at the top of this post was created with my EOS 7D modified with Life Pixel's Super Color IR conversion. As a general rule, I see the world in a 2x3 ratio frame. But even I know there are times when a wider, theater-like view is required to truly experience what it's like to be standing in a specific spot. Maybe you need a wider angle lens but just don't have one. Or maybe you just want to squeeze every pixel of detail out of a scene. No matter the reason, panoramas force you to think about your composition differently. It gets much more difficult to hide "distracting" elements of a scene when you force yourself to capture everything that's in front of you in all its glory. There are many different ways to create a panorama. The easiest way is to simply stand in one spot and point your camera in different directions and stitch the resulting images together in post. Unfortunately, this may not always work well because of parallax errors caused by not rotating the camera body at its no-parallax point. That's exactly why I built my own panning rig for creating 360-degree panoramas. 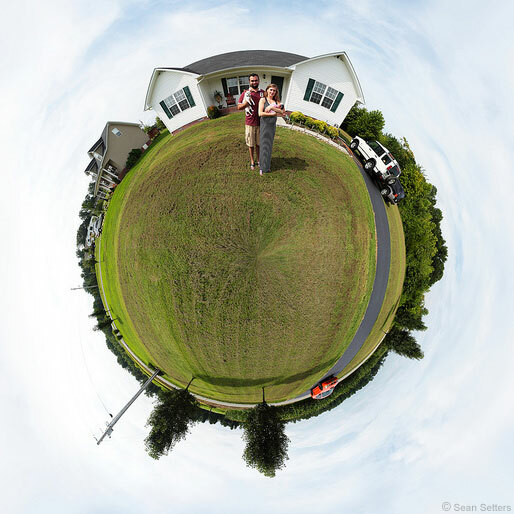 Another way to create panoramas while avoiding parallax errors is to use a tilt-shift lens to capture images at widest extents along the shift plane. No matter what method you use to capture your images, you'll need a decent photo editor to stitch them into a seamless panoramic image. Photoshop CC is a full-featured, reasonably priced option; Hugin is free and open source, but the learning curve is [in my opinion] relatively steep. One way to inspire creativity is to throw another variable into the mix – the element of time. We generally try to capture images that attempt to tell a complete story in a single frame. Time-lapse photography gives us the ability to illustrate changes that happen over time and require a completely different approach to planning and capture. Creating a good time-lapse requires patience, planning, dedication and a fair amount of post-processing. Preparing for time-lapse capture means that you have to consider what elements in your scene will change over time, how to protect your equipment and how to compensate for changes in exposure thoughout your time-lapse. To create time-lapses you'll need a solid support system (a tripod is likely best, but any stable platform will do), a timer remote (if your camera does not have an interval timer built-in), and patience. Shown above is the time-lapse I created when evaluating the Triggertrap Mobile Dongle. The Mobile Dongle (paired with a smartphone) not only allows you to create a time-lapse, but it allows you to adjust the timing and exposure values during capture so that you can be even more creative with your time-lapse. If you already own a macro lens, then you already have everything you need to explore the wonders of your own back/front/side yard. 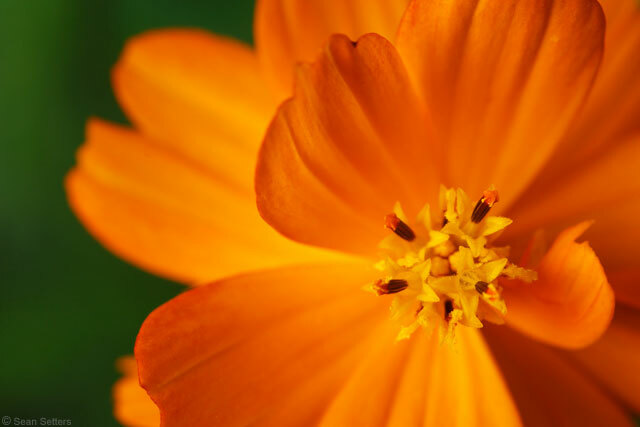 If you do not own a macro lens (and even if you do), using extension tubes with your current lenses will help increase the maximum magnification possible by shortening the lens' minimum focus distance. The flower seen above is located about 6 feet from my backdoor in a small flowerbed. Tip: Plant flowers around your home. Not only will they provide you with ample opportunities to shoot beautiful macros, but your significant other will likely enjoy displaying them in your home. And just in case you forgot a special occasion, being able to pick flowers from your yard may help you avoid the ramifications of your lapse in memory. So that's our top 6 ways for inspiring your own creativity. Do you have other suggestions? Let us know in the comments!